Franklin Roosevelt was the 32nd President of theUnited States of America. He has been the only President of the United States to have been elected four times. He is best known for his leadership of the United States and Free World throughout the Great Depression and the Second World War, during his time in office from 1933 to 1945. He was a dynamic military leader and he had many achievements to his credit. In World War II, the three great world leaders arrayed against Germany were President Franklin Roosevelt of the United States, Prime Minister Winston Churchill of Great Britain, and Joseph Stalin of Russia. Three finer war leaders could rarely have been found in any era. Churchill, a leader with bulldog spirit and possessing fine oratorical skills, Stalin, the man of steel, and Roosevelt, the great politician and compromiser, held the allies together when things looked blackest and then led them to victory over the fanatical resistance of the Germans. Hitler, although a thoroughly evil person for this planet, also had his moments of leadership particularly at the start of his regime. But none of the other Axis leaders (certainly not Mussolini!) were of the caliber of the three Allied leaders. Hitler was outnumbered three to one when it came to top leadership. Franklin Roosevelt pictured in 1933. Roosevelt was a successful businessman and financier. As a child he made several trips abroad, with his parents and had private tutors before he went toGroton from 1896 to 1900. He then went to Harvard and later to theColumbiaLawSchool where he passed the bar but found that he had no interest in the legal profession. In 1905 he married Eleanor Roosevelt, the niece of his cousin Theodore Roosevelt. Together they had a daughter, Anna Eleanor and four sons named James, Elliot, Franklin Jr. and John Aspinwall. WhenFranklinlater became President of theUnited States of America, Eleanor was a politically active First Lady and she was involved in several causes like the Civil Rights and others. He practiced law for a short time but then decided to run for the New York State Senate and in 1913 he accepted an appointment as the Assistant Secretary of the Navy, a post he held till 1920. It was in this period that his capabilities as a successful administrator were noticed and he was recognized as a Democratic politician with great potential. 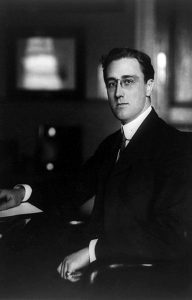 Franklin Delano Roosevelt, three-quarter length portrait, seated, facing left as Asst. Sect. of the Navy. He was not successful when he ran for the post of Vice President of theUnited States of Americain 1920 so he began practicing law once again. In 1921, Franklin Roosevelt was crippled with polio and it seemed that this would be the end of his career. He overcame his disability with great will power and self-determination and also with the support of his wife. She often substituted for him at political meetings. He gradually recovered and once again picked up his political career. His interest in politics grew and in 1929 he was elected as Governor of New York. In 1932 he was nominated as the Democratic candidate for the Presidential election and won against the Republican, Herbert Hoover. That was the time when the country was reeling under the economic depression, but his aggressive campaigning and his optimism which was shown through his campaign song, “Happy Days are here Again” won him a landslide victory and he became the 32nd President of the USA. He took the oath of office on March 4th 1933 and addressed the nation over radio. In his inaugural address he was optimistic about reversing the crisis the country was going through, with the support of the people. 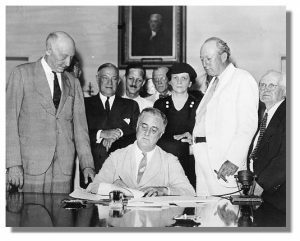 Roosevelt Signs The Social Security Act: President Roosevelt signs Social Security Act, at approximately 3:30 pm EST on 14 August 1935. Standing with Roosevelt are Rep. Robert Doughton (D-NC); unknown person in shadow; Sen. Robert Wagner (D-NY); Rep. John Dingell (D-MI); unknown man in bowtie; the Secretary of Labor, Frances Perkins; Sen. Pat Harrison (D-MS); and Rep. David Lewis (D-MD). System benefited several needy Americans during the time of the economic crisis. The Civilian Conservation Corps was a program where job opportunities were provided in various projects to more than three million people. Electricity was generated from theTennessee Riverto the depressed area through the Tennessee Valley Authority. Aid was provided to cities for further construction and also to improve businesses through the newly created Public Works Administration. The Securities and Exchange Commission was created to correct the problems which caused the crash in the stock market. Franklin Roosevelt was re-elected as President in 1936 for a second term. He won against the Republican candidate Alf Landon with a large margin basically due to the effectiveness of his “New Deal” program. He was re-nominated to the post in 1940 and he won against the Republican nominee Wendell Willkie, who was opposed to his Tennessee Valley Authority Act and also against FDR’s pledge to keep America out of World War 2. In spite of his failing health Roosevelt was once again nominated and also won the election and became the President of the USA for the fourth term in 1944. He died in office on the 12th of April in 1945 due to a cerebral hemorrhage. 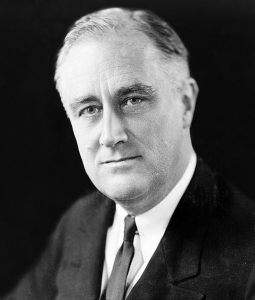 Franklin Delano Roosevelt’s twelve year tenure in office as the President of the United States of America brought about a tremendous impact on the country. His aggressive and bold leadership sawAmerica through two of the major threats that the country faced in those days. His “New Deal” program steeredAmerica out of the economic crises during the days of the Great Depression. There were relief programs and employment opportunities for the citizens. There was an economic growth and several reforms were made by regulation of the stock market and banks. Unfortunately, the Conservative Coalition which was formed in 1937 prevented further legislations being passed and many of the relief programs were abolished with the start of the Second World War. The country was once again reeling under an economic depression. The German Nazi aggression and the invasion of China by Japan in 1938 marked the commencement of the Second World War. Roosevelt preferred to keep America out of the war by remaining neutral but extended financial as well as diplomatic support to China and the United Kingdom. America provided equipment, food and medicines to Britain and its allies in the Second World War. He aimed at supplying the Allies with ammunition by making America an “Arsenal of Democracy”. With the approval of the Congress he created the “Lend-Lease” Act in 1941 which provided aid to the countries that together withBritainwere fighting against Nazi Germany. He made several speeches to his countrymen promising to keep America out of the war. He also created the “Atlantic Charter” with Winston Churchill pledging to defeat Nazi Germany. After Czechoslovakia fell to Germany in 1938, Roosevelt felt sure that Europe would erupt into war and that the United States would likely be drawn in. He knew the British and French were our natural allies and that Germany was wrong in its forced acquisition of surrounding nations. Even though he knew which side we must come down on, he could make no overt maneuvers because this country, including Congress, was militantly isolationist at the time. There was opposition to war from both the right and the left. The right wingers were particularly adamant in their opposition. Some even wanted to join Hitler and attack Russia to clean out the communists. So, even though Roosevelt watched country after country fall into the German's hands in 1939, 1940 and 1941, he was unable to attempt a rescue because public support was not there. 1. In November of 1938, he startled his military advisers by advocating the production of 10,000 military aircraft by 1940 and providing the capacity to produce 10,000 planes per year thereafter. This advice did not set well with some advisors who wanted a more balanced approach. But Roosevelt was trying to let Hitler know what America could produce if aroused. He was hoping to discourage their aggression. 2. In July of 1939, he issued a Military Order moving agencies related to defense to report directly to the president and not to the various official government department heads. This created some confusion since the department heads were often left out of matters. 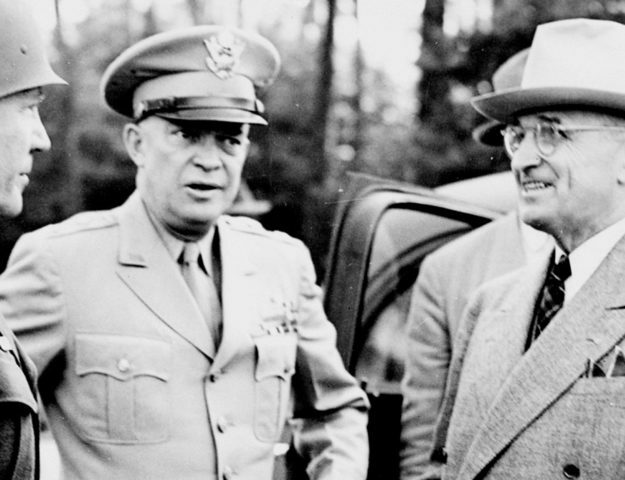 However, the order provided a personal relationship between Roosevelt and the military chiefs. This is the way Roosevelt liked to work. It also magnified the power of the military chiefs. 3. In September of 1940, he made a destroyer deal with Great Britain providing them with 50 overage destroyers in return for a string of bases in the Caribbean. 4. 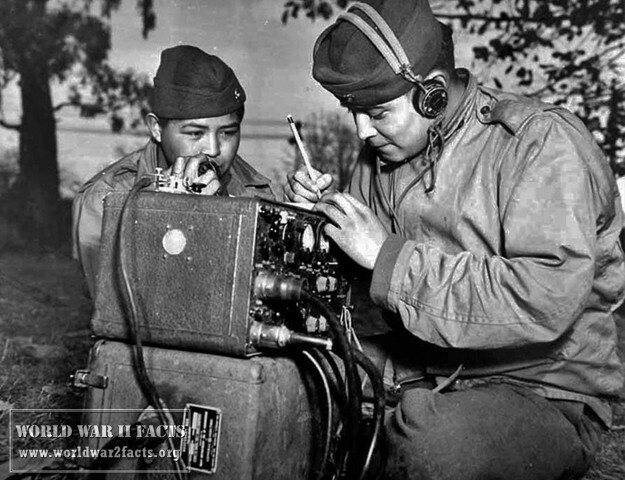 In September of 1940, the Selective Service Act was passed and Americans began to be drafted. 5. In early 1941, he had Congress pass the "Lend-Lease Act" which provided England and Russia with arms via lease but with no conditions for repayment. As Roosevelt said, "When your neighbor's house is on fire, one does not haggle over the price to put it out, the hose is readily loaned and the price is figured later." "No American will think it wrong of me if I proclaim that to have the United States at our side was to me the greatest joy... but now at this very moment I knew the United States was in the war, up to the neck and in to the death. So we had won after all! Yes, after Dunkerque; after the fall of France; ... after the threat of invasion... after seventeen months of lonely fighting... We had won the war. England would live;... Our history would not come to an end....Hitler's fate was sealed... there was no more doubt about the end." Churchill could relax for a moment after standing up to the Nazis, virtually alone, for two years. Roosevelt was one of our greatest presidents. To me, he has always been the very epitome of what an American president should be. 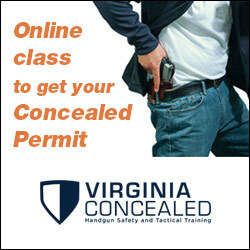 Depending on the crisis at hand, he undertook whatever corrective steps he thought needed to be taken. A child of the upper class, Roosevelt, nevertheless, felt it was his duty to help those less fortunate than himself. His wife (and fifth cousin), Eleanor also had strong feelings in that direction and encouraged Roosevelt in his efforts. Although he often had to compromise with his fellow rich and powerful, Roosevelt was a true champion of the "forgotten man." Roosevelt was conscious of the power of the presidency and used it as no one ever had before. He worked his way through two major crises in his +3 terms as president: the depression and World War II. Conference leaders during Church services on the after deck of HMS Prince of Wales, in Placentia Bay, Newfoundland, during the Atlantic Charter Conference. 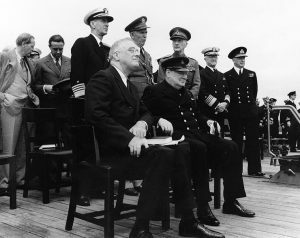 President Franklin D. Roosevelt (left) and Prime Minister Winston Churchill are seated in the foreground. Standing directly behind them are Admiral Ernest J. King, USN; General George C. Marshall, U.S. Army; General Sir John Dill, British Army; Admiral Harold R. Stark, USN; and Admiral Sir Dudley Pound, RN. At far left is Harry Hopkins, talking with W. Averell Harriman. America was forced to enter the Second World War after the Japanese attacked Pearl Harbor on the 7th of December in the year 1941. With the support of the Senate, he got America to declare war against Japan. Franklin Roosevelt was an active military leader. He strengthened theUS forces with equipment and man-power during the earlier years of his tenure as President. He remained Commander-in-Chief of theUS armed forces till he died in office. It was in his tenure that the atomic bomb was developed. This was a momentous feat as it was the first atomic bomb in the world. He helped the allies defeat the German-Japanese Axis Powers with his war strategies and with the help and support he gave his military leaders. In 1942 he ordered the internment of thousands of American citizens of Japanese origin. Just prior to the start of World War II in September 1939, Roosevelt had written Churchill (Churchill was not yet prime minister) and the two opened a correspondence and began a warm friendship that would last until Roosevelt's death in 1945 although problems began to occur near the end because of Roosevelt's hesitancy in joining Churchill in moving to limit Russian expansionism. This close relationship between the two leaders, of course, spilled over into the relationship between the countries. It led to the creation of the Combined Chiefs of Staff which was a joint military command over all British-American operations. It also led to the development of a second front in France, development of an atomic bomb, creation of the United Nations, and final defeat of the axis powers. Roosevelt's usual hands-off approach as Commander-in-Chief was unlike his restless friend Churchill's approach. Churchill could not refrain from meddling with the British commanders in the matters of tactics and strategy. It should be noted here that, for all his greatness, Churchill's meddling did not always have a happy ending as he often wanted to move the allied thrusts to obscure (e.g., invade the "soft underbelly of Europe") theaters away from the primary theater. At these times, he sometimes seemed to act as a child playing with his toys. He had had the same problem in World War I when he initiated the doomed attack on Gallipoli, Turkey, a disaster which cost him his position. He was almost - but not quiet - as bad a meddler with the military leaders as Hitler. The two leaders had much different personalities. Roosevelt was a very political man, a man who used his charm, a compromiser, and a man who tried to avoid any controversy. His approach was always the indirect approach. (Had Roosevelt been a military man, he would have followed the "indirect approach" of Liddell Hunt.) And by no means was Roosevelt an open man. He did not easily reveal his reasons for making decisions so his subordinates constantly had to try to read his mind and it did not appear to bother him at all to keep them guessing. The Bronx political leader, Edward Flynn, once observed of Roosevelt, "Roosevelt would adopt ideas only if he believed in them. If he disagreed, he simply did nothing." Churchill, on the other hand, had a very opposite personality. His was the direct approach. He loved controversy and debate. He presented his ideas openly and loudly with much documentation and with great fervor. His associates and critics alike were allowed to do the same. He was an 'open read'. You always knew where Churchill stood on an issue. Because of his pugnacious disposition, Churchill was always getting knocked about by someone and had often, in his career, lost whatever job he might have at the time. But he had great tenacity and always got back on his feet full of fight. Such different men, but together, they made a great team. They, along with Stalin, ran the war and won it. Amongst the important victories for the Allies and the United States of Americaagainst the Axis powers were the Battle of Midway, the North African campaign, the capture of Sicily after a joint amphibious attack, the campaign in the Pacific and finally the “D-Day” invasion. 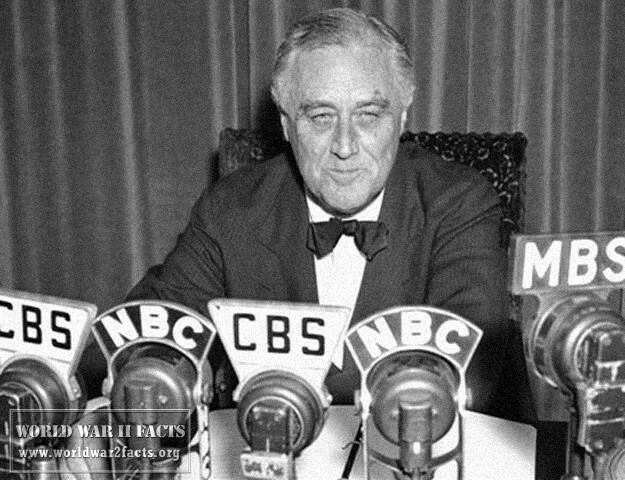 Rooseveltwas always in close contact with Winston Churchill and other European leaders through the war. Many meetings were held at various places to discuss war strategies and later to talk about world peace. Churchill and Roosevelt also met Joseph Stalin atYaltawhere concessions were pledged to Russia if it entered the war againstJapan. They discussed the end of the war and the matters pertaining to peace in the world. With the end of the war in sightRooseveltspent a great deal of time in planning the establishment of the United Nations. He wanted the UN to be a permanent peace time group with powers to thwart all effort towards war. He was hopeful that the year 1945 would be remembered in history for all the achievements and the beginning of the efforts to organize peace in the world. In April 1945 an important international meeting was organized in San Franciscoto draw up a charter for the formation of the World Organization. Many nations were to take part in this conference on the 25th of April 1945. According to the plans, Roosevelt was to open the conference. The delegates had begun arriving for the conference, when on the 12th of AprilRoosevelt slumped forward in his seat as he was signing documents. He died of a cerebral hemorrhage. He died before he could see the end of the war. 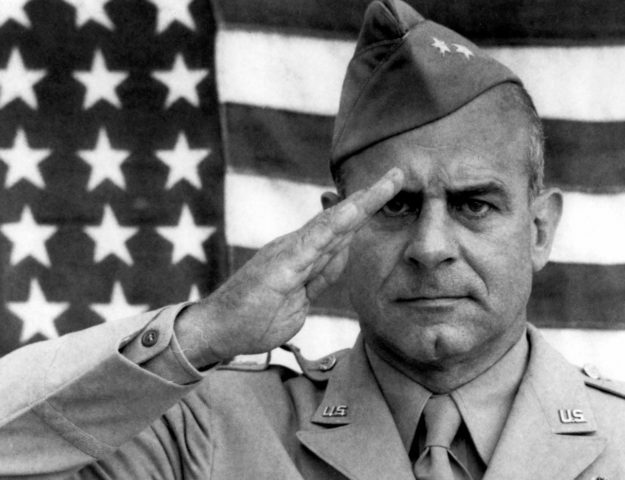 With his strong leadership Americaand the Allies were able to win the war against the Axis powers. He left a tremendous impact on his country during his twelve year tenure as President and the impact lasted for several years after he died. Though many of his countrymen disagreed with his domestic and foreign policies he had millions of supporters who elected him as President for four terms. Franklin Delano Roosevelt will be remembered as one of the greatest Presidents of theUnited States of Americaand as the administrator who created the United Nations for world peace. Three Against One: Churchill, Roosevelt, and Stalin Against Hitler by Vance Stewart. The leaders of three great nations - Britain, the United States, and Russia face Adolf Hitler and Nazi Germany in World War II. Hitler was outnumbered. World War II was a fight to the finish...give no quarter, receive no quarter. Winner take all. Those were the days of giants. Compare those men with the pitiful leaders we have today. No wonder we are heading down the road to disaster. And about half the population of the United States doesn't seem to have the common sense or education to realize where we are heading. They need to study World War II more and see where great leadership can take you. The Conquerors: Roosevelt, Truman and the Destruction of Hitler's Germany, 1941-1945by Michael Beschloss. Discusses the political maneuvering by President Roosevelt and, later, President Truman in determining how post-World War Germany was to be handled. Roosevelt's reluctance to deal with the Jewish problem, which was becoming well known, is documented. Treasury Secretary, Henry Morgenthau, Jr., shocked at Roosevelt's inattention to the issue accused President Roosevelt of acquiescence in the murder of the Jews thereby risking his close relations with Roosevelt. Morgenthau became so enraged over the Holocaust that he laid out a plan ("Morgenthau Plan") for the total destruction of Germany's factories as a means of preventing Germany from ever starting another World War. Secretary of State Cordell Hull, and Secretary of War Henry Stimson opposed the plan and leaked it to the press to help kill it. There is also considerable information on Roosevelt's illnesses and their affect on him. Did the Russians take advantage of his deteriorating health? Truman's ability to pick up the pieces after Roosevelt died is also documented. Somehow, things worked out regarding German reconstruction and this reconstruction is now widely regarded as the model for post-war reconstructions. How do we repeat the success in Iraq? A Man Called Intrepidby William Stevenson. A book about espionage in World War II. Roosevelt was fortunate to have a very competent espionage service in World War II. Espionage prevented the Germans from developing the atomic bomb among other things. In addition to discussions about espionage in World War II, the use of intelligence in the beginning of the cold war is also discussed. As one reads this book, he cannot help but feel sad as he observes the competence of America's espionage forces during World War II and compares it with the apparent incompetence of the present intelligence forces during the buildup and aftermath of the second Iraq War. The formerly first class British intelligence service doesn't appear to be any better off. This book is a must-read for the World War II buff and those who would like to see our present intelligence mess straightened out. FDR and the Holocaust by Verne Newton. A collection of 13 essays on the subject. Why didn't we offer more refuge before the war when Jews were allowed to leave Germany?